Nutmeg and mace are related. Nutmeg is the seed inside a fruit. Mace is the tissue that covers the nutmeg seed. 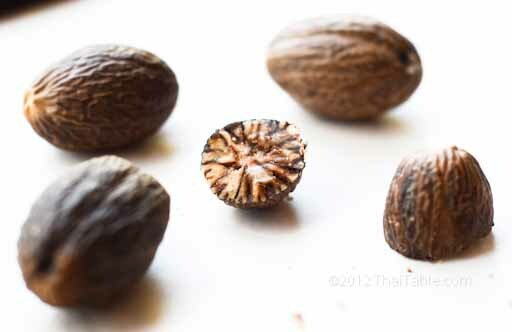 In Thai cooking, nutmeg is used for making savory dishes and well as dessert. Furthermore, it's also used as medicine. An ingredient in a popular Thai curry, Massaman Curry Paste is made with nutmeg. Nutmeg is available ground and whole at supermarkets. However, I prefer to get mine at an Indian/Pakistani markets because they have a higher turnover rate on spices and they are less expensive. I'd recommend getting whole nutmegs. Once ground, nutmeg loses its fragrance over time.